As a podiatrist, we fabricate many pairs of orthotics every day. Most of the time, the orthotics are made to help a foot related problem. In addition, podiatrists are well trained to understand and analyze a patient’s gait, thus, if a patient comes in with a knee or back problem, we can help by prescribing orthotics. Now, not all back problems get better with orthotics. If the back problem is caused by foot instability, an overpronatory foot type, and/or a limb discrepancy, orthotics can be beneficial. Dr. Hannan, wrote in the September 2012 journal of Rheumatology, that a foot that is pronated during gait was associated with low back pain. In Hannan’s study, she found that a pronated foot function carried a 51% higher risk of low back pain in women than in men. She goes on to say that men and women have different ranges of motion and function in the spinal joints. Women have more of a pelvic tilt and have more hip rotation than men do. I say to my patients, if the foundation of your house is weak, then the house that is resting on it will fall apart. A lot of knee, hip and lower back pain can be contributed to a weak ground floor, which is your feet. If you are not suffering from structural damage in your back and your knees, let’s say from an injury, then you should definitely see a podiatrist to get your feet checked. Orthotics that relieve lower back pain can save you money because you will take less or no pain medication and even have less visits to your doctors. Most of the patients at Family Foot & Ankle Specialists love their orthotics, which have allowed them to stand longer and run or exercise again. 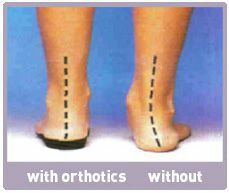 In general, orthotics can get your life back again and is a very easy and simple solution to a lot of back, hips, knees, and feet problems. ?Do I Need To Have My Feet Measured Every Time I Buy A New Pair?